Under the leadership of its Co-President, Lorraine Pace, Breast Cancer Help has worked with community and governmental leaders to ensure that cancer patients, survivors and concerned citizens positions are heard and that progress is made in the fight against breast cancer and other forms of cancer. The Long Island organization’s leadership has fought many successful battles to secure the passage of legislation to enhance insurance coverage for patients, increase awareness, and ensure that cancer research and programs are funded. Rebba Martin, Co-President of Breast Cancer Help, originated the ever-expanding breast cancer mapping project in 1992. This original mapping project spearheaded the breast cancer environmental movement. Rebba and Breast Cancer Help assisted more than 25 breast cancer coalitions to form and map locally, nationally and abroad, including two minority coalitions at Sisters for Sisters with Beth El AME Church in Copiague and another in Coram, as well as the Marin County Breast Cancer Watch in 1995 with Christopher Lucas, Matthew Hill and Dr. Thomas White. These mapping projects helped lead to the creation of the New York State Cancer Registry, through the efforts of New York State Senator Kemp Hannon. For more information on the zip code registries go to www.health.state.ny.us. To learn how you can conduct mapping in your community, contact Breast Cancer Help, Inc.
Knowing that early detection is our best protection, Breast Cancer Help has worked to increase awareness of breast cancer and other cancers. These efforts have included breast and testicular cancer awareness in public schools, establishment of diagnosis and treatment hotlines, grassroots awareness campaigns, and working with members of the media to ensure that residents receive accurate and timely information about breast cancer and other cancers. In March of 2003, Breast Cancer Help opened its Long Island Cancer Help and Wellness Center in Lindenhurst with the goal of increasing cancer awareness to promote early detection, while providing patients and survivors with needed support. Since then it has held numerous lectures to increase early detection and inform Long Islanders about medical advances and how to live healthier. It has also developed ongoing programs to provide cancer patients and survivors with the assistance they need to overcome cancer through complementary integrative modalities that meet their psychosocial needs. These include a monthly support group, art therapy, massage therapy, and yoga. Under the guidance of its former Executive Director, Alex Fezza, the Center has established one of the region’s most active cancer support and wellness programs. Breast Cancer Help has worked with various elected officials to ensure that cancer research is a national commitment. It also worked to establish the New York State Cancer Registry and a federally funded study seeking to learn the causes of breast cancer and other cancers. It has also supported research at Cold Spring Harbor Laboratory. Breast Cancer Help has worked to ensure that Long Islanders have access to the best medical diagnosis and treatment available. In 2001, it contributed $100,000 and procured an additional $250,000 to allow Stony Brook University Hospital to purchase the first two of three modules for the Novalis Radio Surgery system. Later that year, it guaranteed a 63-month lease for the GE Digital Mammography System and began making lease payments in excess of $7,000 per month. In 2003, it contributed half of the funds to purchase the Confirma CADstream MRI reader, allowing for improved diagnosis of breast MRIs. To help fulfill our goal of ensuring that Long Islanders have access to the best possible medical care and diagnosis available, Breast Cancer Help contributed $100,000 and procured an additional $250,000 to allow Stony Brook University Hospital to purchase the Novalis Radiosurgery Equipment at Stony Brook University Hospital. The technology is used for the non-invasive delivery of precise dose of high-energy radiation to a tumor located within the skull. It is available in the radiation oncology department of Stony Brook University Hospital and Medical Center. For years, Breast Cancer Help directed all of the net proceeds of its current fundraising efforts toward the purchase of a lifesaving Novalis radiosurgery system for use in the radiation oncology department of Stony Brook University Hospital. Developed by BrainLAB, a manufacturer of powerful computer-guided medical instruments, the Novalis system represents cutting-edge technology in stereotactic radiosurgery; that is, the non-invasive delivery of a precise dose of high-energy radiation to a lesion located within the skull. This type of surgery is typically performed on an outpatient basis and, because no incision is required, it avoids the risks, costs, and recovery time associated with traditional brain surgery. Stony Brook’s commitment to advancing cancer care was recognized in 1998 with federal and state grants enabling the establishment of the Cancer Institute of Long Island at Stony Brook, which is designed to serve as the region’s premier cancer center. Combining the resources of a major research university with those of a major medical center has made Stony Brook the choice institution in the region for the establishment of a comprehensive cancer center supported by the National Cancer Institute. The total cost of the Novalis system is $2.2 million and a phased approach is planned for the purchase of the equipment. The first phase involved the purchase of the initial machinery to treat regularly-shaped brain tumors from all types of cancer. The second phase, which is not completed, involved the purchase of machinery to treat tumors with an irregular shape. Suffolk County Executive Robert J. Gaffney recently presented a check for $250,000 to be combined with a $100,000 contribution from Breast Cancer Help, to purchase this equipment. The equipment in the third phase must be purchased in one section at a cost in excess of $1 million. In addition to Breast Cancer Help’s direct contribution, the completion of phase two was made possible by donations from the State University of New York, Suffolk County Executive Robert Gaffney, and various federal government entities. Pictured (left-right), in front of a digital mammography system, are Deborah Schreifels, Director of Community Relations, Stony Brook University Hospital; Lorraine Pace, Co-President of Breast Cancer Help, Inc.; NYS Senator Caesar Trunzo; Dr. Allen G. Meek, Chairman, Department of Radiation Oncology, Stony Brook University Hospital; Dr. Paul Fisher of Stony Brook University Hospital’s Long Island Cancer Center. Trunzo is recently seen being thanked by the staff of Stony Brook University Hospital and Breast Cancer Help for his support in the fight against breast cancer. The Senator recently secured a grant in the amount of $250,000 from New York State that is being used to cover over 32 months of leasing costs for a digital mammography system currently in service at Stony Brook University Hospital. 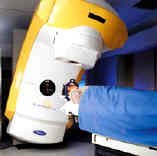 In March of 2001, in a rare example of a non-profit organization working to improve the quality of health care on Long Island, Breast Cancer Help, Inc. guaranteed a 63-month lease agreement with General Electric Medical Systems and began to make payments exceeding $7500 per month to provide Long Island’s first FDA-Approved, non-research, digital mammography system at Stony Brook University Hospital’s Long Island Cancer Center. In addition to being the first digital mammography unit available for clinical use on Long Island, it was also the first such unit available at an academic medical center in New York State. In addition to being a state of the art clinical tool, the digital mammography unit has been available to researchers at Stony Brook to help advance the breast cancer research program. “This is a great day for all Long Island women. We thank Senator Trunzo for his efforts to ensure that Long Island women continue to receive the most advanced and precise mammography screenings available anywhere. This is especially important for those women with dense breast tissue and for those who receive inconclusive results from standard mammographies. This technology is reassuring to any woman who may need a mammography to know that they do not have to go far to receive the best possible diagnosis,” said Lorraine Pace. The advanced mammography system, known as the GE Senographe 2000D Full Field Digital Mammography system, retails at over $600,000. The system’s digital technology offers the capability to acquire images in near-real time, provides enhanced processing options and suggests the possibility that mammograms may be taken at a lower radiation doses, particularly in dense breasted women. Pictured are members of Breast Cancer Help with Jeffrey Picarello (front, center), Director of Public Affairs at Cold Spring Harbor Laboratory. Picarello recently discussed the important research being conducted at Cold Spring Harbor relating to genetics and cancer at Breast Cancer Help’s Long Island Cancer Help and Wellness Center in Lindenhurst. Breast Cancer Help donated funds to Cold Spring Harbor Laboratory for the purchase of a confocal laser scanning microscope that allows researchers to view breast cancer cells three dimensionally, as the result of a grant received from Sons of Italy. Pictured (left-right) are Lynda Distler, Executive Director, Cancer Help and Wellness Center; Lorraine Pace, Co-President, Breast Cancer Help with Dr. Paul Fisher, Chief of Breast Imaging at Stony Brook University Hospital. Dr. Fisher is pictured thanking Distler and Pace for Breast Cancer Help’s contribution to the purchase of the Confirma CADstream MRI Reader. Breast Cancer Help, Inc. donated $19,800 towards the purchase with the remainder donated by the Walk For Beauty Committee. The reader is in use in the Long Island Cancer Center at Stony Brook University Hospital and is able to provide the most accurate real-time breast detection capabilities available.